Many of you will have heard by now that we have to vacate our current premises by the end of December. Six weeks is not long to find an alternative, and the likely scenario is that we will have to close temporarily – I hope, at least, that it will be temporary. It is going to be difficult to find new premises that are suitable and that we can afford, but we want to try – there is still so much I want to do at and with the Tree House Bookshop, and things have really started to go well in the last three months or so, with lots of exciting things planned for next year. Most importantly, there is a wonderful community of people who use the Tree House regularly, who have made friends with each other through it, who contribute so much to what it has become. It would be very hard to break this apart! 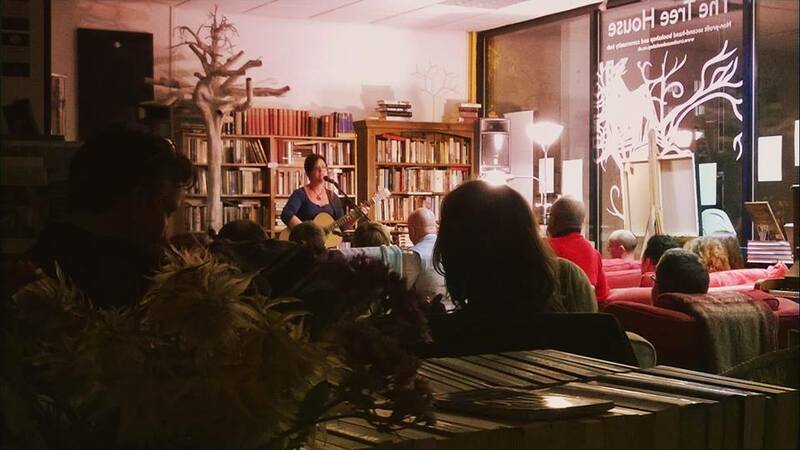 The bookshop can downsize, and it can always still be a meeting place however small, but the events we have run – the film nights, the music gigs, the recently-established open mic nights, the lectures and more – have been crucial to fostering this sense of community, and we need a big enough space to continue to host these events. So we are looking for new premises in Kenilworth. In the meantime, we are going to spend our last few weeks at Abbey End making the most of what we have, and doing a bit of fundraising so that we have as strong a financial position as possible when it comes to securing a new site. When we first opened, a friend gave me this lovely song by Wilco as my signature song, and one that seemed appropriate to this venture of setting up what many thought was a crazy idea. Who buys books? How will it ever work? It turns out that (as I always knew) lots of people buy books, and it works because it draws people together. Much of the main street of Kenilworth is taken up by restaurants, charity shops and estate agents, and we have been able to offer something a bit different in the centre of town. Local independent businesses are closing all the time, and we are sad to be the latest to be forced out. But the idea itself of the Tree House is working, it’s not that we are leaving because we’ve failed – and while it’s hard to stay positive at times, I keep thinking of this song and all it has meant, and I still believe there will be a way for us to carry on. We will stay open late on Friday 28 November for the Christmas lights switch-on in Warwick Road, so call in and see us! And come to one of our events – open mic on 29 November, Folk Night on 6 December, It’s a Wonderful Life at Film Club on 18 December, Haddo at Christmas on 20 December and more…look at our Events page for more information. Hope to see you soon! Another splendid open mic night on Saturday 8 November! Here is a slideshow of some of the performers – many thanks to Grace Holme for the photos. Next one is on 29 November; if you would like to take part, just email Lewis and Charlotte at treehousesessions@treehousebookshop.co.uk – if you want to listen, just turn up! £2 for everyone, but you get that back as a voucher to spend in the bookshop. An inspiring day, in an inspiring venue, spending time with the most inspiring people. Gigs like this are precious. Apart from books, live music is the best thing we have to offer at the Tree House. We’ve had some brilliant gigs over the last 16 months, and we are planning lots more. We can only seat 30-40, so gigs are always intimate, with comfortable armchairs and sofas for those who arrive early and an ever-boiling tea urn. You are always welcome to bring a bottle of something stronger – we are not licensed, but it’s fine for people to bring their own alcohol – and we have wine glasses and corkscrews. We charge £1 for corkage (tea and coffee is also £1 a cup). We have started regular open mic nights, which we call the Tree House Sessions; our first one was fantastic, and our second one this Saturday, 8 November, promises to be as good. Come along and listen – we charge £2 entry, but you get a £2 voucher to spend at the bookshop. Best value night out around! They will be slightly irregular up to Christmas, but from January we plan to make them fortnightly. On 15 November, we have a cabaret evening courtesy of Unlock the Music, a charity in Coventry that supports new talent. Something different for us, and again promises to be wonderful – tickets are £8, with money raised going to the charity. You can buy tickets online or through the bookshop. On 6 December, we have Sharpe & Guy and The Somerville Gentlemen coming to give us an evening of folk music, each act performing either side of an interval. Brilliant musicians all, another fantastic night of live music to look forward to! Tickets are £6, available through the bookshop. Then on 20 December, we have the brilliant folk duo Haddo making a return appearance – they wowed us shortly after we opened, in August of last year, and this time are coming to play Christmas music – come prepared to sing a few carols as well as listen to some wonderful music. Will Pound is now an established figure on the folk scene and beyond, and Nicky Pound is a fabulous viola player and singer, and as a duo they are a force to be reckoned with. Festive treats will be available too. Tickets are £7, available through the bookshop. We are planning more music for the new year – the focus will remain folky, in a broad sense, as this suits the venue well and suits the personal taste of those of us organising the events! Here is a photo of Ange Hardy performing in September – a wonderful evening! Hope to see you at something very soon – and do spread the word! I have woefully neglected the blog part of this website of late…will write something soon, but in the meantime here are a few recent photos. Ange Hardy at the old Tree House – another chance to hear her in Kenilworth this September! We created a place where people come to meet friends, to get to know each other or sit quietly and read.